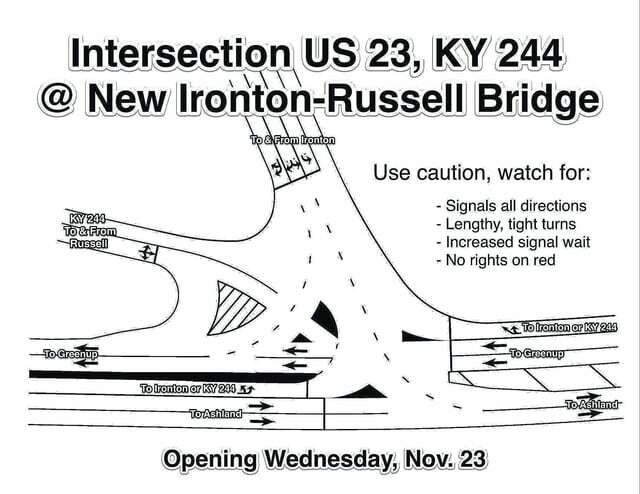 FLEMINGSBURG, Ky. (Nov. 23, 2016) – Motorists using the new Ironton-Russell bridge should expect changed traffic patterns on the Kentucky side at the new four-way intersection in Greenup County. New traffic signals are in place and will control bridge (Ohio 93), US 23 and KY 244 (Russell viaduct) traffic in all directions. With the addition of bridge traffic, wait times at intersection signals will increase. And, due to the width of the intersection, traffic will need time to clear the intersection before signals change. At times, all signals will be red for up to 10 seconds before the next green phase starts. Due to the possibility of conflicting traffic, right turns on red will not be permitted at any traffic signal. In addition, since the Russell viaduct intersects at a sharp angle, some traffic movements will include lengthy or tight turns. Traffic islands, turn arrows and “cat track” hash marks have been placed on the pavement to help guide vehicles. However, motorists should use caution until familiar with the new traffic patterns. – Northbound US 23: When signal is green, two thru lanes will carry traffic toward Greenup, and a right-turn lane will carry traffic to either KY 244 into downtown Russell or across the Ironton-Russell bridge. – Southbound US 23: When signal is green, two thru lanes will carry traffic toward Ashland, and a left-turn lane will carry traffic to either KY 244 into downtown Russell or across the Ironton-Russell bridge. – KY 244: When signal is green, traffic coming from downtown Russell can either continue straight to US 23 South, turn right onto US 23 north or turn left onto the Ironton-Russell bridge. – Ohio 93: When signal is green, Ironton to Kentucky bridge traffic can use dual left-turn lanes to access US 23 south, use dual right-turn lanes to access US 23 north or use the far right lane to turn onto KY 244 to downtown Russell. Traffic technicians will be monitoring the intersection once the bridge opens. As traffic adjusts to the new intersection configuration in the coming weeks, signal timing and other conditions could change. Again, motorists should travel the area with caution until familiar with the changed traffic conditions. Find more information about District 9 online at http://transportation.ky.gov/district-9. Navigate traffic with KYTC, http://511.ky.gov, and Waze, http://waze.com!